Japanese tank development & production leading up to and during World War 2 did not yield any great successes or offer the same threat to the Allied tanks as the other Axis forces did. It wasn’t until the mid 50’s that Japan started tank development with the Type 61 (heavily influenced by US tank design) and then the Type 74 in the late 60’s. Development to replace the Type 74 with an indigenes design that could defeat the Russian T-72, started in the mid 70’s under the designation STC, which was changed to TK-X by the Technical Research Headquarters of the Japanese Self-Defence Force. The first prototypes were completed in 1982, first sporting a Japanese designed/manufactured main gun. Further prototypes mounted the Rheinmetall L44. By 1991 the vehicle passed field testing and orders for the first MBT built with all Japanese parts, with the exception of the main gun, were made and first production models were completed in 1992, by the Japanese company Mitsubishi Heavy Industries under the designation Type 90 for the Japan Ground Self-Defense Force. In late 2008 I sat down and drew up a chart comparing the mobility of all modern MBT’s using a 2006 Janes recognition Guide and surprisingly found that the Type 90 (shared with the Leclerc) had the highest rate of mobility! This is achieved by its light weight of 50 ton’s, it’s powerpack (Mitsubishi MT1500 automatic transmission forward gears 4, reverse gears 2 and diesel engine) which generates 1500 horse power and its hydrogas suspension. The suspension allows the vehicle to either lower or raise the front or rear of the vehicle to hugely increase or decrease the elevation of the main gun, which gives it greater fighting capabilities in mountainous area’s, which most of Japan is. The Mitsubishi Steel Works and Kyoto Ceramic Company developed the armour for the vehicle. A number of sources claim that the Type 90 has composite or laminate/composite armour. Judging by the lack of angled surfaces and the number of almost vertical surfaces the vehicle does in fact use laminate armour. Either side of the main gun are two distinct modular armour box’s. These contain vertical ceramic tile’s, which are commonly mistaken as composite armour. The armoured protection of the vehicle is said to be able to withstand frontal attack from a APFSDS round fired from a Length 44 cal 120mm cannon. The main cannon is a licence built L44. Manufactured by Japan Steel Works it is an almost identical copy, using the same breech, with the exception of the recoil system and gun mount, were designed and built locally in Japan. Subsequently it can fire the normal smoothbore rounds such as APFSDS and HEAT rounds. The vehicle was one of the first outside of the WARSAW countries to develop and employee an automatic loader, thus reducing the crew to three. The vehicle can carry 35 rounds and its believed that 16 of those is stored in the auto loader (the rest next to the driver), which is believed to be able to load a round every 2 seconds. For close encounters, the vehicle mounts the standard 7.62mm coaxial MG and a .50 cal MG is mounted on the roof in front of the Gunners hatch. There are also two banks of three electrically operated smoke grenade dischargers, one on either side of the turret. The vehicle also has the normal NBC system. The commander’s independent sight has day and night capabilities, (10 x zoom day and 3x night). The sight can track vertically from −29 to +29 degrees, as well as track horizontally through 180 degrees. The gunners sight has a 10 x zoom. The Mitsubishi Electronics fire control system has been up-graded a number of times and can now track moving targets. 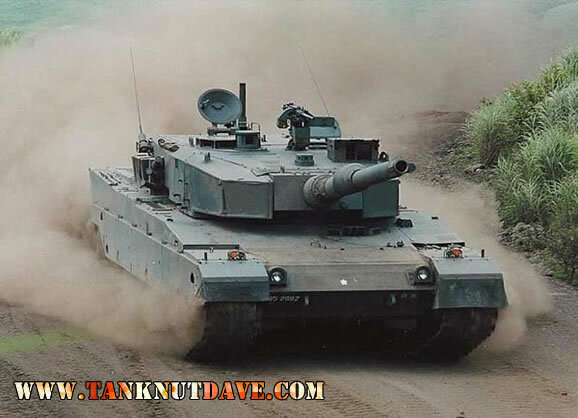 The Type 90’s introduction in to the JGSDF has been gradual and with the decision not to offer the vehicle to the export market, it is currently the most expensive tank to manufacture in the world. As of 2009, 315 are in service as the countries principal MBT. 561 Type 74’s are still in service (this number is gradual decreasing). The Type 10 is the successor to the Type 90 and is due to enter production in 2010/11.